The Kind Bed System offers four pieces that work together in harmony to bolster and support your body while sitting upright. Ideal for those confined to bed for extended periods of time or for those who enjoy reading, watching TV, or relaxing while in bed. Curved back wedge pillow follows natural curvature of spine for proper alignment and full upper body and back support. Slide the back scoop for adjustable lumbar support. If the lumbar support is too much, simply flip the back scoop upside down. 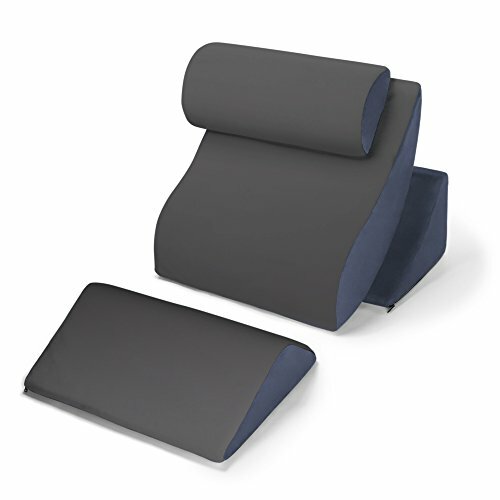 Leg wedge provides adjustable support and elevation to help with aching pressure points for hips, legs and feet. Each piece is constructed from supportive medium density foam core layered with a one inch of premium 4LB Visco Memory Foam. Covers are crafted from luxuriously soft and breathable micro-velvet fabric (with microsuede on the sides). All covers can be easily removed and are machine washable. If you have any questions about this product by Avana, contact us by completing and submitting the form below. If you are looking for a specif part number, please include it with your message.